We’ve only been broadcasting our live video stream for a couple of weeks, but already we’ve risen to the top of the heap on Ustream. Ustream.tv is the website that hosts the live video stream from the Rochester Falconcam. It has become the most viewed on a daily, weekly and monthly basis, and we’re ranked the number 3 falcon cam since Ustream began service. 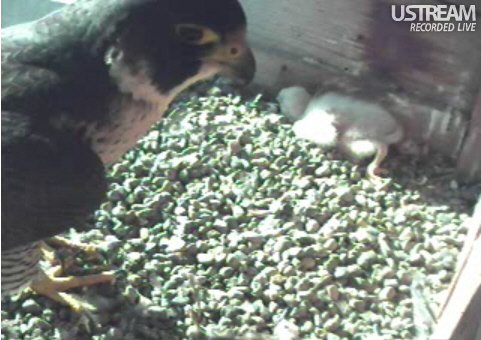 Turns out we’re not the only falcon webcam that’s streaming video. 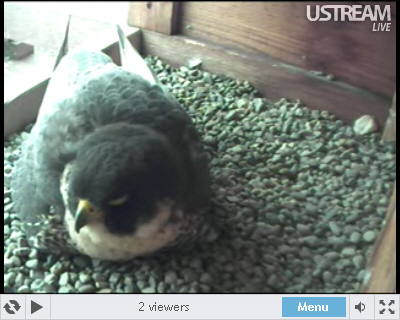 If you search Ustream you’ll find about 30 webcams dedicated to falcons. When you consider that some of these other falcon webcam sites have been operating for years, that’s something worth cheering about. The fans of the Rochester Falconcam are key to our success, and we want to thank each of you for tuning in to see Archer, Beauty and the new eyases. 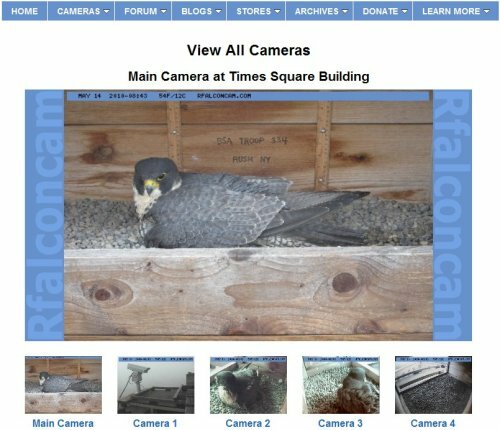 By making us the most-viewed live falcon webcam the Rochester Falconcam is at the top of Ustream search results. That means new viewers are more likely to find us and tune in as well. Nothing succeeds like success, so give yourselves a big hand and keep watching! Sometime during the night it seems that Beauty disposed of the remaining unhatched egg. Either she decided it was non-viable, or it became damaged. She may have consumed it or just removed it from the nest. We’re not exactly sure what happened to it, since the actual disposal wasn’t captured on any of our cameras. 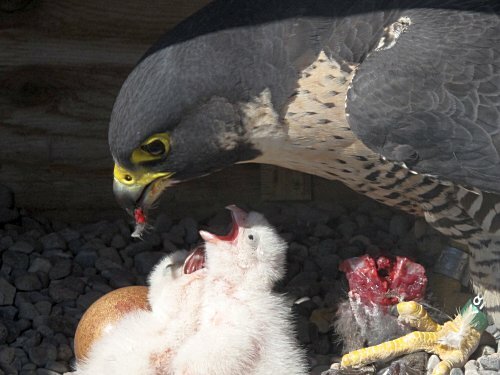 It’s not unusual for first-time Peregrine parents to have some of their eggs fail to hatch. 2002 was the first year that Mariah and Kaver were together. Mariah laid four eggs that year but only two hatched. We’d have welcomed three eyases, but for new parents, two is an excellent number. It gives Archer and Beauty an opportunity to hone their parenting skills. The basics come naturally to them; caring for young is instinctual. But like anything else, they’ll get better with practice. We’re already seeing Archer being more consistent with bringing food to Beauty, and he’s looking a little more comfortable keeping the eyases warm while Beauty gets out for a little hunting and wing stretching of her own. Beauty is doing a great job of feeding the eyases, and with just two hungry mouths to feed, it’s likely both of the young falcons will get plenty of food. With all the excitement around the hatchings it’s easy to forget that we have other subjects to update. Quest has been zipping all over the north shore of Lake Ontario this month. Yesterday it looks like she headed north for a day trip up to Georgian Bay. She shows no signs of slowing down, or settling down either. The two newly hatched eyases passed their first uneventful night tucked beneath Beauty for warmth and protection from the elements. The eyases can go for about a day before they need a meal, but that doesn’t mean that they aren’t hungry. In fact, they’re pretty much hungry all the time! So you’re likely to see a lot of feeding going on. Our high-resolution Main camera caught some great pictures of the second feeding this morning, which took place at 10AM local time (the first happened five hours earlier). In the photo above you can see typical feeding behavior. Both eyases have their bills open in anticipation of getting fed. 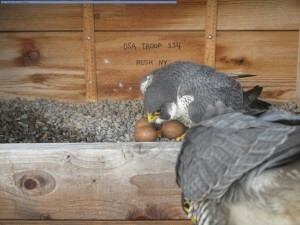 Archer delivered the food to Beauty and she took it into the nest box. She ripped small pieces of the prey (an unidentified small gray bird) and fed them to each of the eyases until they had enough. How did Beauty know she’d fed them enough? Because the sated eyases lose interest in more food. They stop begging and lay down for an after-meal nap. Watch for this pattern to repeat itself as many as five or six times a day. By the time the eyases are five days old they’ll have doubled in size! That takes a lot of food, delivered over many feedings. Now that we have a live video feed, it’s easier than ever to see how a feeding happens. Tune in if you haven’t checked it out yet, and let us know what you think. Even more viewers (nearly 600!) watched Beauty & Archer’s second egg hatch just after 7PM this evening. The sound of the eyas making the final breakthrough was transmitted very clearly, and Beauty was perfectly positioned in the nest box to give everyone viewing our new Live Video Stream a front row seat. 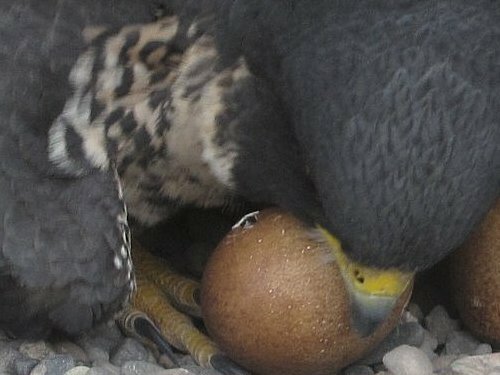 The third egg could hatch later tonight, or it might take as much as another 24 to 48 hours. Watch along with us! We’ll also put the highlights up on the Rochester Falconcam channel at YouTube. We’ve had the first hatch of 2010, just a little after 3PM Rochester time. In the picture above you can see the fresh pink skin and white hair-like feathers of the eyas which has just emerged from its egg shell. It’s damp and blind right now, and the newly hatched chick can’t regulate its own body heat, so Beauty will be covering the eyas to keep it warm and dry on this damp Rochester afternoon. Almost 400 viewers got to watch the hatching live, as it happened. If you weren’t one of them, you still have a chance to catch the other two eggs hatching. Just tune into the Rochester Falconcam’s Live Video Stream, and you too can join the fun while we wait for the other two eggs to hatch! Viewers watching our new Live Video Stream have seen the first hole in one of the eggs that Beauty and Archer are incubating in their nest box high atop the Times Square building in downtown Rochester. The picture above shows a small hole in the top of the egg that Beauty is cradling. The first stage of hatching is called pipping. 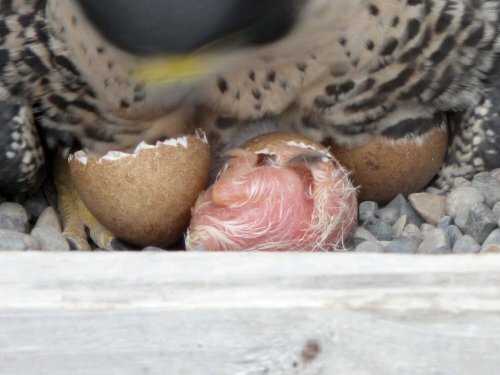 Pipping occurs when the falcon chick, or eyas, pokes a hole in the egg shell. Gradually the eyas will enlarge the hole, then work its way around the shell until it cuts off the top and pops out. The process can take anywhere from a couple of hours to a couple of days (if you need a refresher on hatching, take a look at this article from 2007). And thanks to our new live video feed, you can watch it as it happens. You may even get to hear a peep or two from the hatching eyas! If you haven’t taken a look at the video feed yet, now’s a great time to join the hundreds of Rochester Falconcam fans who are already watching. Hatching should continue over the next couple of days, so stay tuned to catch all the action! Live Video & New Camera Page In Time For Hatching! Year after year we’ve been asked why we didn’t provide a live video feed from the Rochester Falconcam. There were a variety of financial and technical issues that kept us from offering video, and frankly we’ve preferred to concentrate on offering the highest quality still images available on any nature-oriented webcam site. But thanks to recent advances in Internet technology, it’s now possible to provide live video “webcasts” at little to no cost, and without needing to maintain expensive streaming video servers and dedicated network connections. Thanks to these improvements we’re finally able to offer live streaming video along with the high-quality still images you’ve come to expect. 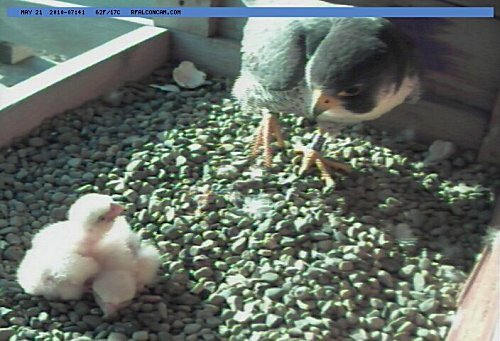 So just in time for hatching to begin, we’re very happy to announce the opening of the Rochester Falconcam Live Video Stream! 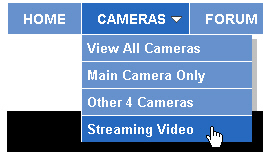 Simply go to the Rochester Falconcam, click Cameras at the top of the page, then choose Streaming Video. You may need to wait a few seconds for the video stream to appear. Just click the button at the bottom of the screen to start playing the live webcast. Now you can see and hear what’s going on in the nest box day in and day out, 24/7. And if you can’t watch all the time, don’t worry. When we see something especially interesting, we’ll record it and post it on the Rochester Falconcam channel at YouTube. We’ve also improved our Camera layout on the website. Now you can see all of the camera images on a single page. Click the Cameras link at the top of the page and you’ll find a new item on the menu called View All Cameras. The new view might not work with all Internet browsing software though, so we’ve left the Main Camera and Multi Camera pages in place. Watching these magnificent birds in real time allows you to view a whole new side of Peregrine behavior that you may never have seen before. Go ahead and try it out! We think you’ll like what you see. Well, it’s getting close to the time when Archer and Beauty’s three eggs should begin to hatch. They’ve been doing a great job of incubating the eggs. 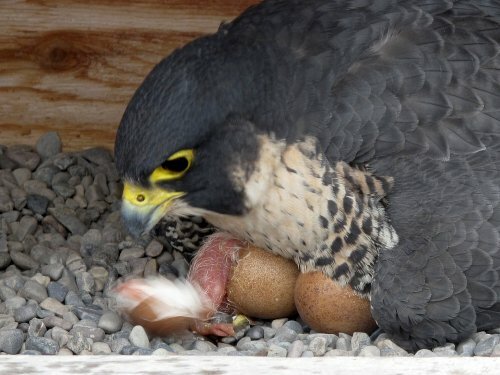 In typical Peregrine style, Beauty has done most of the brooding, but Archer has shown him self to be a dedicated egg-sitter too. In an article last month we speculated that hatching should begin sometime between May 16-18. We’re still sticking to that estimate, so we expect this weekend to bring some excitement. If you haven’t been keeping an eye on things, now would be an excellent time to start. Watch the falcons to see how restless they are. When hatching is near, they’ll get fidgety, changing position on the eggs frequently, in response to the noise and activity they hear from the eggs. If you don’t remember how hatching works (or if you’re new here), take a look at our article on hatching from back in 2007. Of course, Archer and Beauty are new to us, so we can’t necessarily say if they’ll meet the 33-day incubation time. It could be a few days more, or even a couple less. Your best bet is to keep watching the Rochester Falconcam cameras so you can be sure to catch all the action. Write a comment and let us know when you think the eggs will hatch! Quest closed out April near her familiar stomping ground, but in the first part of May she’s been moving around. Her path over the past ten days or so has followed Highway 401 for the most part. She’s been as far to the northeast as Cornwall on the outskirts of Montreal, and as far westward as Ajax, near Toronto. In between it looks like she may have spent a couple of days at the Thousand Islands Bridge. Since she’s showing no sign of settling into a territory it’s a fair bet she hasn’t attracted a mate. Apparently the life of a bachelorette suits Quest just fine for now. You are currently browsing the Imprints blog archives for May, 2010.